St Barnabas is often called 'the encourager'. Acts 4:36,37 tells us that he was a Levite from Cyprus, and that he sold a field to contribute towards the finances of the early Church. 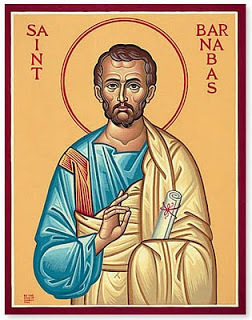 In Acts 11:19-26, it is Barnabas who is sent to investigate reports of new churches, and who goes to find the newly converted apostle Paul. And in Acts 13 & 14 we read of the travels that Paul and Batnabas undertook together, spreading the Gospel. June 11th is kept as St Barnanas' Day.